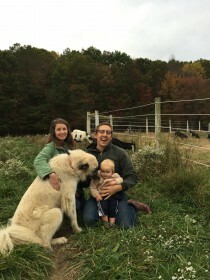 Carolyn, Jacob and baby Finn with Cotton the dog on their farm outside of Lexington, Kentucky. Thanks for being great hosts! Last week I traveled to Lexington, Kentucky for the American Farmland Trust’s “Farmland, Food and Livable Communities” conference. The conference was the first of its kind to focus on these challenges at the national level and it brought together a broad spectrum of service providers, funders, land trust staff, and young farmers. Farmland conservation has always been about thinking forward and protecting land for future generations, but it was exciting to see that resolve taken a step further at the conference. There were many discussions, both in workshops and informal networking, about how we can ensure we are protecting farmland for future generations of farmers. As NYFC wrote about in our Farmland Conservation 2.0 report, published last year, keeping farmland affordable for farmers is an urgent challenge that the conservation community is well-suited to help address. Sunny Valley Preserve is a 1,850-acre property owned by The Nature Conservancy in Connecticut. The Conservancy has made a number of capital improvements to the existing farm infrastructure and rents out the 450-tillable acres on the property to five different farm families. One of the tenants is 21-year old Felice Marten of Nature View Farm, who was given a lease by TNC when she was 19 to start her raw milk dairy operation. The Vermont Land Trust has been conserving farmland in the state since 1977 and has developed a number of program areas to help the next generation of farmers access land. The six main examples of this are: (1) purchasing a farm, issuing a request for proposals, and matching a farmer with the property (which is protected by a conservation easement before being sold to the young farmer); (2) distributing bridge loans to farmers who have found a property they want to buy but need upfront cash; (3) providing technical assistance to young farmers on loans, mortgages, and business planning; (4) buying and holding a farm property until the young farmer can generate enough cash flow to purchase it; (5) working with a young farmer to place an easement on a property simultaneously while the farmer purchases the land from the previous owner; and (6) conducting matching services between landowners and farmers. The Delaware Young Farmers Program is a state-run program that helps farmers who are getting started purchase farms. The loan program, established in 2011, provides farmers with a 30-year, no-interest loan up to 70% of the appraised value of the development rights on the property. Individuals can receive up to $500,000 towards the purchase of land, which then has a permanent conservation easement placed on it limiting future development. The program has made 25 loans so far in its three years of existence. While these examples are promising, it was encouraging to see participants asking questions about how we can push this work further and do more. Over two-thirds of American farmland is held by farmers 55 and older. In the next two decades there is a lot of work to do to ensure that when that farmland transfers, young farmers are given an opportunity to be at the table. Yum! 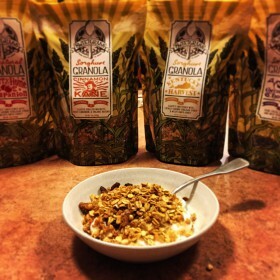 Some Sweetgrass Granola breakfast. Carolyn and Jacob were fantastic hosts – feeding me dinner made with chicken from their farm and introducing me to other local farmers (not to mention sending me home with bags of their delicious granola). 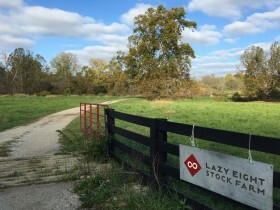 The couple left their jobs in New York City to farm together and eventually ended up in Kentucky where Jacob grew up. They raise pastured poultry, goats, and a few sheep on their farm. They also grow high tunnel vegetables and make amazing sorghum-sweetened granola using local sorghum and other Kentucky-sourced ingredients. Besides her farming and new-mom duties, Carolyn works full time with a Kentucky nonprofit called Community Farm Alliance supporting young farmers in the state through the Agricultural Legacy Initiative. The entrance to one of the fields at Lazy Eight Stock Farm in Paint Lick, KY.
Bryce and his family run a 400-acre Certified Organic vegetable and livestock operation nearby to Jacob and Carolyn’s farm. Bryce has been growing vegetables since he was 12 on the property, which is located on the same road that his family has farmed on for generations. A few years ago he started a vegetable CSA, which has grown to 80 members. Much of the land around the farm is in tobacco or conventional livestock production, but Bryce and his family have found the CSA model to be a good fit for their business and ideals. 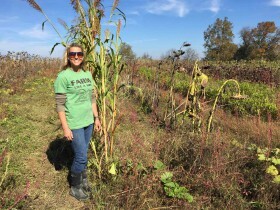 Brooke Eckmann with her sorghum plants on Ambrosia Farm. When we visited Brooke she was in the midst of harvesting peanuts, but graciously took time out of her day to show us around the farm. Brooke was teaching in a local school until four years ago when she decided to buy land outside of Louisville and start farming. She now grows 82 varieties (!!) of tomatoes (along with a number of other vegetables, fruit trees, and nut trees) and sells to a local restaurant. She opened a farm store on the property this year and is in the process of restoring an old tobacco barn to hold on-farm events. Unfortunately, I didn’t get to visit Ben and Bree’s farm as planned while I was in Kentucky, but I did talk to them on the phone (and ate some of their produce at Carolyn and Jacob’s!). The couple grows vegetables for wholesale and sells to restaurants in Louisville. Finding land that is appropriate for their business has been a challenge for Ben and Bree, and they have farmed on four different properties in five years. Their most recent property is promising – they have a five-year lease and are hopeful that the landowner is interested in exploring more long-term options. « previous article: The FSA Microloan Expansion is Coming November 7th!